Traywick Contemporary is pleased to announce an exhibition of works on paper by Los Angeles based artist Stas Orlovski. This will be Orlovksi's third solo show with Traywick Contemporary. Stas Orlovski's Nocturnes are unique explorations of the subtleties of consciousness. 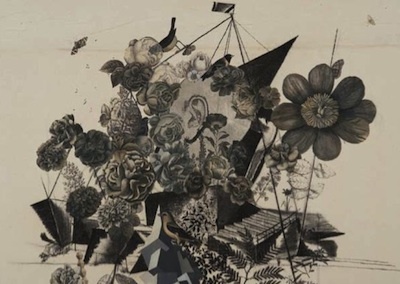 Drawing on Russian folklore, children's books, Persian miniatures, 18th and 19th century illustrations and botanical prints, his pieces are fantastical gatherings of natural and cultural remnants. Orlovski arranges his collage compositions on Japanese papers applied to stretched canvas, a medium that allows him to "pull images out of the surface much like recovering a memory, or waking from a dream." He integrates seemingly disparate imagery and combines artistic mediums, ranging from charcoal drawings to newspaper clippings, to create pieces that are at once unfamiliar and alluring. Shadowy birds, delicate botanical drawings, and sculptural fragments are nestled within thoughtful accumulations of images that invite the viewer into private realms of being. Stas Orlovski earned a BFA from York University in Toronto in 1992 before earning an MFA from the University of Southern California in 1996. Orlovski's work is featured in prominent private and public collections including the Fine Art Museums of San Francisco, the Houston Museum of Fine Arts, the Phoenix Art Museum, the University of Southern California and the American Embassy in Brussels. In 2008 Orlovski was honored with a City of Los Angeles Individual Artist Grant, which he has used toward the development of the Nocturne series.